There’s a big misconception about money. So often we hear that money is the root of all evil. At the end of the day though, we all need it to pay our bills. Money itself is just a thing, and it’s all about how you choose to use that thing. Money itself can’t be evil, because it’s just an idea. When you have money, it allows you more opportunities and freedom. More money means you have more chances to help, give back, and achieve growth. On this episode of Creative Warriors we are joined by Vincent Pugliese. Vincent has a Bachelor Degree in Communication from Ohio University, where he was named National Champion for the William Randolph Heart Photojournalism Championship prior to graduation. Vincent has photographed for all of the leading wire services and various national and local publications throughout the United States. Vincent has photographed all major sporting and news events, including the Super Bowl, the World Series, the NHL Final, the NBA Conference Finals, The Kentucky Derby and even Wrestlemania! Vincent has been assigned to photograph events in nearly every state in the nation. He has joined us today to discuss his new book, Freelance to Freedom: The Roadmap for Creating a Side Business to Achieve Financial, Time and Life Freedom. Download this episode today to hear the truth about money, and the real difference between being a freelancer and an entrepreneur. 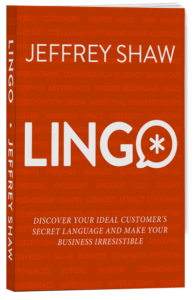 My book, LINGO: Discover Your Ideal Customer’s Secret Language and Make Your Business Irresistible is now available for pre-order. It’s ok to admit you do things for money. Families generally don’t talk about money. You have to pay the bills, but beyond that you need to think about other people. Genuinely build relationships that aren’t based on your needs. Money doesn’t necessarily buy you the freedom. Do stuff for the people that help you. Freelancers build a business around themselves. Entrepreneurs build a business that can be sold. Everyone has a big “BUT”. Top 10 Tips I Learned From Earning 32k In A Year to 32k in One Day!